If you have been dreaming of a vacation home 2 miles from Walt Disney World, put this condo at the top of your list! This fully furnished, 3rd floor unit (in a building with 2 elevators) features 3 bedrooms and 2 full bathrooms spread over a spacious 1450 square feet. The open living room and dining room at the center of the condo divides the unit into a split floor plan for privacy. 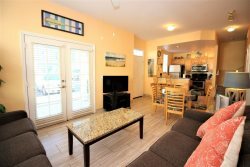 Features include free wifi, large closets, upscale furniture, flat screen TVs, fully equipped kitchen, a full sized washer and dryer and a screened balcony. 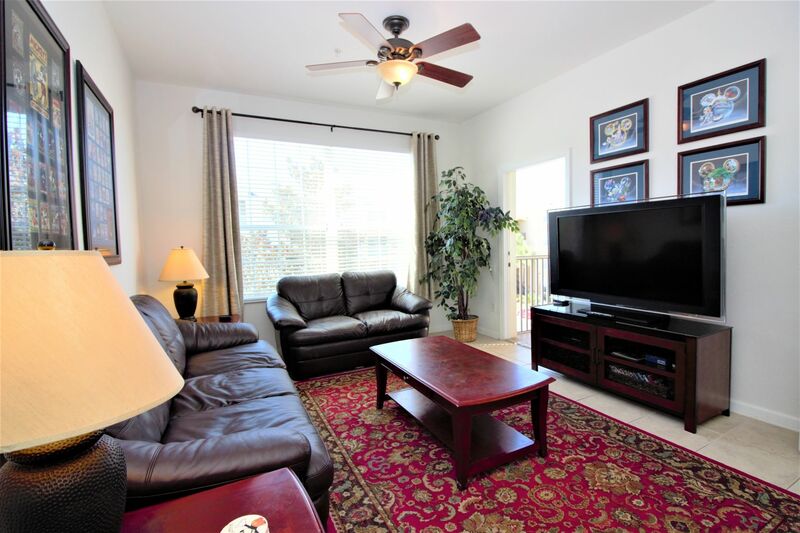 The bedrooms have carpet, and the rest of the unit has easy to maintain ceramic tile floors. The master bedroom has a king sized bed, a flat screen TV and its own attached ensuite bathroom. There is a queen bedroom and a room with two twins beds. These rooms share the hall bath. Some of the magnificent features of this guard-gated community include a luxurious water park pool and clubhouse with fountains, waterslide, and a hot tub lagoon spa. The resort has tennis courts, playground equipment and The Mystic Dunes golf course is very close by. The clubhouse has a game room, an HD movie theater, a fitness center, a games room, and a video game area. The guard gated resort offers a sundry shop and shuttle service to the parks. The heated Double Olympic Size Swimming Pool with waterslide is surrounded by many seating areas, as well as outdoor poolside ping pong and a splash deck for the kids! The clubhouse and lagoon hot tub area are set next to a beautiful wetlands area, amidst lush tropical landscaping throughout the whole resort. As well, there is a local management company just a phone call away in the event of an emergency.